These are lyrics by Johnny Horton that we think are kind of funny. 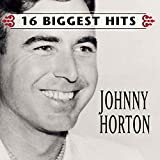 Johnny Horton's, "Battle Of New Orleans "
We fired our cannon 'till the barrel melted down so we grabbed an alligator and we fought another round. We filled his head with cannonballs, powdered his behind and when we touched the powder off the gator lost his mind. Just too funny! But seriously, do you think animal activists would like to hear about a gator having its head blown off? Johnny Horton's, "Sink The Bismarck"
Only in the hillbilly Mayberry RFD mentality can someone think that steers are bigger than trees.